New memorial for fallen soldiers takes visitors on a 'reverse journey in time,' director says. its security services killed in the line of duty. The recently opened monument at the Mount Herzl national cemetery in Jerusalem aims to honor and educate, but it has also been included on a list of finalists for a top international architecture prize. Its core is a curved, 250-meter (825-foot) wall composed of thousands of uniform bricks, all seamlessly arranged with the names of the fallen men and women. At the memorial's entry, a video installation by Israeli artist Michal Rovner juxtaposes groups of soldiers from various periods in the history of Israel's wars, moving and running on one shared landscape before fading away. "Stone, concrete and light are the only materials used here," said Etan Kimmel, the architect who designed the site. "This place has a way of saying strong things -- but quietly." The site is, at once, a means to alleviate the pain and burden of bereaved families and an educational facility for the general public, while reflecting in its design the shift in how Israeli society commemorates those in the security forces who were killed or died during or as a result of their duty. The wall includes more than 23,000 names of every fallen service person -- from the army, police, Shin Bet internal security agency, Mossad spy agency and prison service -- and the date of each death inscribed on one of the small bricks. A ramp of smooth concrete winds up and around a sculpture of larger bricks in a conical shape that leads to the ceiling opening to the natural light above, which is gently reflected on the bricks. The names begin with the most recent fatality and at the end of the site is a brick with the name of the Jewish guard, who was killed in Jerusalem in May 1873 as part of a dispute with the Palestinians over water in the years before Israel became a nation. The movement from recent to past creates a "reverse journey in time," said Yair Ben Shalom, director of the site for the Defense Ministry which was behind its creation. It is the first time Israel has commemorated the memory of all its fallen service people in one site, said Ben Shalom, and is "an open history book of the Zionist settlement enterprise." Israel, a small country with compulsory military service, has seen myriad wars and conflicts since its founding in 1948. Cities commemorate their fallen, children learn the stories of those who sacrificed their lives for the state, and the annual memorial day has a unique status of reverence. But, while in the past Israel focused on the collective memory, the personal aspect is becoming more central, with the inscription of the names a manifestation of that shift, those involved in the monument's development say. 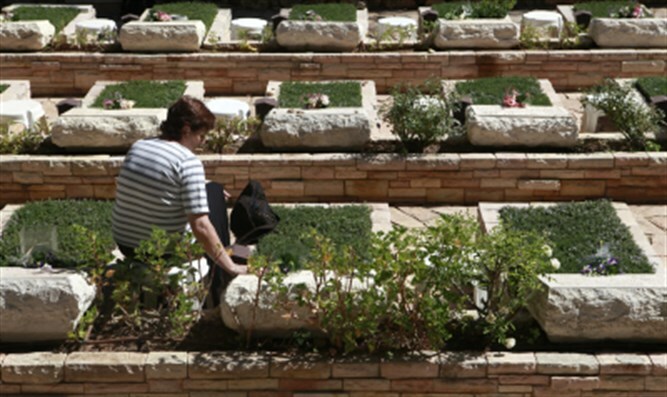 The state's way of memorializing its fallen is moving "from the collective to personal," Ben Shalom said. Kimmel, of the Kimmel Eshkolot architectural firm, said having the names on the bricks is "a gentle way to tell the stories" of those killed in the line of duty. Planning and building the site took 10 years, and it was finally opened to the public in October last year. The monument is also on the list of 62 projects contending for the prestigious Royal Institute of British Architects' 2018 international prize. "The Jews were never great architects. We were a nomadic nation and our building tradition was not glorious," Kimmel said. "We're not a nation of monuments." A small light bulb juxtaposed to each engraved brick enables it to be lit on the date of the person's death, as per the Jewish tradition to light a candle. The names are inscribed in natural Galilee stone whose veins and cracks can be seen in places. Near the site's upper exit, 12 pillars with screens display the pictures and details of the men and women who died on that day in history. place where the state, society, will remember their beloved ones for ever." Kimmel tells of one bereaved mother, who came to him after seeing the site and said: "I can die now. My fallen son has a place, and is being remembered."